Home Posts tagged "12 knights"
First Rank is a fortnightly term-time newsletter for everyone interested in chess for education. In this issue, we present an early view of the recently concluded Erasmus+ CHAMPS which developed an innovative approach to teaching mathematics through the medium of chess. The material will form the basis for an ECU Chess and Maths course for primary teachers and chess instructors. The purpose of the CHAMPS (Chess and Mathematics in Primary School) project is to develop a new category of ‘chess-maths’ exercises in which mathematical games and puzzles are represented in a chess format. The objective is to highlight some mathematical ideas which can be communicated via the chessboard and pieces. As far as the children are concerned, they enjoy playing chess so being given some chess-like problems seems natural. It does not feel like a maths lesson. Conversely, some maths lessons may be enriched by such exercises without the need to be a chess player. His most famous book “How to Solve It” (1945) sold over 1 million copies. 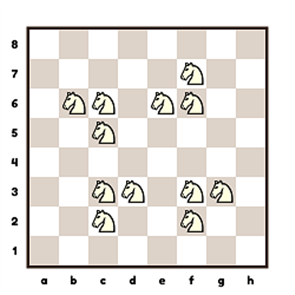 Q1a: Can you place 12 knights on the board so they cover all squares? 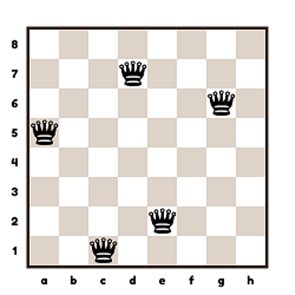 Q1b: Which knight should be placed on a new square so every square is covered? Q2b: Five queens are placed on the chessboard. Add three more so that no queen can attack any other. The CHAMPS project is exactly what I think we should be looking for. Chess gives the framework which encourages children to learn. Within the 64 squares of the chessboard and with the help of the 32 pieces the possibilities are almost unlimited for what and how we teach. The unique thing with the CHAMPS project is that everything is taken to a new level. Modern didactic ideas are used, and every exercise has got a clear purpose and is tested in practice. We must adopt this approach in all areas where we use chess as an educational tool. The Emperor agreed, amazed that the man had asked for such a small reward – or so he thought. What do you think, was it a small reward that the wise man asked for? And can you calculate how many grains of rice if only half the board is filled? Half the board would contain 4,294,967,295 grains of rice. If one grain of rice weighs 25 mg, the total weight is over 107 tonnes which is equivalent to the weight of a blue whale! A mathematical solution is here.